The Wichita Aero Club awarded its first the Edward W. Stimpson scholarship to Kansas State University junior Herbert “Bert” Hutchinson of Wichita during a ceremony following its annual Wichita Aero Club Golf Classic at Crestview Country Club on Sunday, June 9. The tournament raises funds for the Aero Club’s education initiative. Mr. Hutchinson, who was accompanied by his parents, Herbert and Susan Hutchinson, was presented with a giant facsimile of a check for $2,000. He is working towards a bachelor’s degree in aeronautical technology at K-State Salina. A licensed pilot, he is nearing a Certified Flight Instructor rating. He’s also a member of the University’s Flight Team and plans to pursue a career as an airline pilot. The scholarship honors the memory of Ed Stimpson, the late President of the General Aviation Manufacturers Association and ICAO Ambassador. It is currently awarded annually to a student who seek to make a significant contribution to the aviation industry upon completion of his or her education. The scholarship presentation was held at the 19th Hole Reception following the WAC Golf Classic. 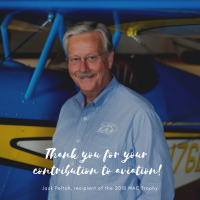 The check was presented by John O’Leary, vice president of engineering for Airbus Americas Engineering and Chairman of the Wichita Aero Club’s Education Committee, and Patrick Tuttle, president of ADR, Inc. and Chairman of the Board of the Wichita Aero Club.